A few weeks ago the ACP Board unanimously voted to support the candidacy of Arkady Dvorkovich for the FIDE presidency, an unprecedented stance in the history of our association. Never before had ACP supported any candidate, feeling that we should remain neutral in the political arena. However this could no longer be the case. Major problems require major, groundbreaking decisions. In a large part this decision was taken as a result of a major disappointment with the current FIDE leadership, especially when you consider that Mr. Makropoulos has been a top FIDE official uninterruptedly from 1986 (that’s all of 32 years). However, it was not less important for ACP to hear Mr. Dvorkovich's opinion on the matters we find vitally important for chess and we were pleased to see that he shares our views on many issues. FIDE’s work has been utterly ineffective for quite some time now - the work of many Commissions is poor and they are not independent as they should be. The whole decision-taking process is non-transparent to the extreme, with budget allocation criteria unknown to everyone but a handful of top executives and the most important decisions often taken single-handedly without a proper discussion. On top of it, there is no proper communication with the outside world, there are no lasting commercial partners and many of the deeds regarding the major FIDE events are obscure at best. The lack of transparency gets to such a degree that often the members of respective Commissions don't know about the decisions taken by their own Commission. All these problems must be seriously tackled and Mr. Dvorkovich’s vision is similar to ours in this regard. We have repeatedly stressed that this is a life-threatening problem for chess, but FIDE, which reluctantly agreed to set up the Anti-Cheating Commission in 2014, has since then hindered the work of the Commission in many ways: by not funding it properly, by not providing it with the tools it has been repeatedly asking, by letting outsiders write the regulations that the Commission should have written. In other words, ACC is only a formal body with little power to make an impact on the fight against cheating. Mr. Dvorkovich is the only candidate who specified his intention to fight the issue by allocating the much needed funds and approving the required regulations. ACP feels this is vital for chess and will fight side by side with Mr. Dvorkovich to make sure that an effective anti-cheating framework is implemented. This is a very troublesome area. To start with, the last title match saw the highest budget for such an event ever but also one of the lowest prize-funds in modern history. That is simply ridiculous. Restoring transparency and respect for the players is a very much needed action. It is not irrelevant to mention that the Grand Prix series suffered a major blow in recent years, mainly due to FIDE’s inability to attract corporate sponsors. We feel this could change with Mr.Dvorkovich being elected. Top female players suffer from lack of suitable events. Even the World Championship cycle is constantly rescheduled and reshaped. Events are cancelled and the strongest female player in the world refuses to participate in the official competitions that are organized in this haphazard way. This can no longer continue. 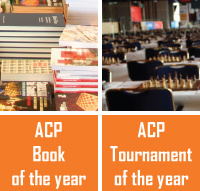 ACP welcomes Mr. Dvorkovich’s written engagement to establish a properly functioning World Championship Cycle for Women, re-establishing the Grand Prix series, introducing the Candidates Tournament and aligning Open and Women's Championship Cycles. FIDE has first reduced and then discontinued its support for this important project, which safeguards the dignity of players who made the history of our game. Mr. Dvorkovich, on the other hand, plans to re-establish it, something which ACP warmly welcomes – having fought for this program from the very beginning. In addition, conditions for the World Veteran competitions must be improved. Today these events have a very clear commercial purpose, while we want our distinguished veterans to be engaged with chess without being overcharged time after time. The dates of the major events are regularly shifted and that creates a major problem for both players and organizers of traditional events. The chess calendar should be carefully planned two years ahead and FIDE should stick to it. ACP strongly supports the view that no President should be serving for more than two consecutive terms. This is vital to democracy in every major organization and FIDE is no exception. Additionally, ACP supports Mr. Dvorkovich’s idea of a FIDE General Assembly every year. This will encourage change, adaptation to the changing times and will provide Commissions with the much needed feedback from the chess community. During our meetings with Mr.Dvorkovich we have extensively discussed these and other issues and we can clearly see his professionalism and ability to bring about the necessary changes. ACP is ready to join forces with the Dvorkovich Team and be proactively involved in all the processes that can make the professional chess world a better place.